For the past several years, home buyers have been able to search for properties throughout the Carolinas on their smartphone or tablet, via TateMobile, Allen Tate Company’s mobile website and apps. 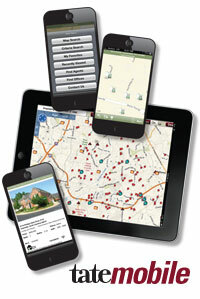 With TateMobile, buyers have access to 100,000 homes on allentate.com, updated daily, directly from the local MLS. Now TateMobile is even better. You can use the Map Search feature to search for properties geographically. TateMobile will also automatically center on your location, which is really convenient if you are riding in a car looking at properties. You can access driving directions to a property. The Feature Search can be really helpful. Say, for example, that you are only interested in a two-story home, and two-car garage is a must. Simply plug in keywords “Two story + garage” after you have narrowed your search geographically or by price, and you’ll only see available properties with these criteria. Likewise, if you do not want a home located on a corner, you can exclude “corner lot” as part of your search. One of the most important things we believe is that real estate is personal. The “Claim Your Agent” feature on TateMobile is aligned with this. By selecting your Allen Tate agent on TateMobile, you can easily contact them when you find a home you’d like to visit, or send them a referral when your cousin or co-worker is ready to buy. If you don’t have TateMobile yet, go to m.allentate.com from any iPhone, iPad or Android device or download free apps from the Apple App Store or Google Play Store.